This box is a companion piece for the Make-Up Box. The same size - 8 cms square and 4.2 cms high - it is worked on 16-count antique white aida, and lined with dark chocolate brown evenweave. The design represents a luxurious box of chocolates, tied with a purple ribbon. 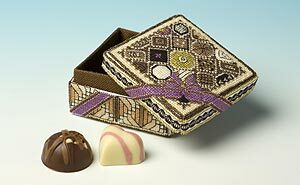 The sweets are worked using two strands of thread, while the box is worked using one only, so when you touch the box lid the chocolates seem to stand out. Unfortunately, the kit does not include the sweets shown in the picture.